I haven't been able to find China Glaze's Crack Collection anywhere in stock in my area, but a friend of mine was on vacation in Florida and happened to stop by a nail supply store. Being the awesome and thoughtful person she is, she picked up two of them for me. So today I did a manicure with Lightening Bolt (white crackle) over black (Wet'n'Wild Black Creme) and Black Mesh (black crackle) over white (Wet'n'Wild French Creme) on my accent finger. I used SpaRitual Multitasker as the base and Barielle No Chip Speed Dry as the top coat. I loved how elongated the crackle pieces in Black Mesh looked, way different from BarryM Instant Effects and OPI Black Shatter! I was less impressed with China Glaze Lightening Bolt though, it was quite streaky and you could see through many parts of it. I did like how geometric Lightening Bolt's final appearance was though. 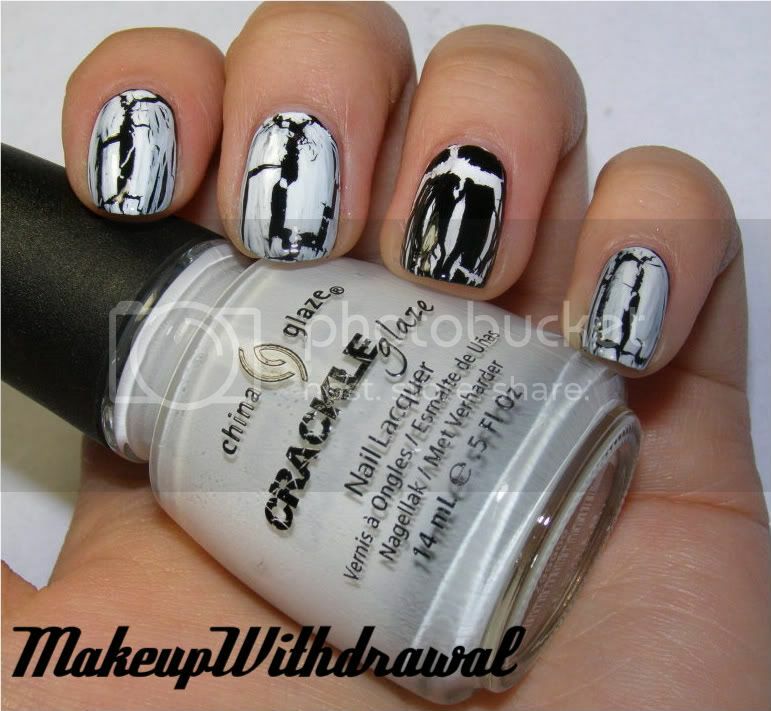 Since I have many black crackle polishes (OPI Black Shatter, BarryM Instant Effects, CoverGirl Crackle in Boo! and China Glaze Black Mesh, I'm thinking about doing a comparison post. What do you think?